The Fifth Judicial District Commission on Judicial Performance unanimously recommends that Chief Judge Mark D. Thompson BE RETAINED. Judge Thompson was appointed to the District Court bench in Summit County on December 1, 2010, upon the retirement of Judge Ruckriegle. This is his first performance evaluation. After graduation from Bates College in 1989, Judge Thompson received his law degree from the University of Denver in 1992. Before his appointment to the bench, Judge Thompson practiced as a civil litigation attorney, with a firm in Breckenridge, Colorado, focusing primarily on construction and related matters. The Commission reviewed written evaluations of Judge Thompson from attorneys and non-attorneys, his written self-evaluation, a sampling of Judge Thompson’s legal rulings, observed Judge Thompson in the courtroom, and received input from the District Attorney, the Public Defender, law enforcement, and other general members of the public. Forty-five attorneys were surveyed regarding Judge Thompson. Of those 45 attorneys, 96% recommended retaining Judge Thompson, 2% made no recommendation and 2% recommended Judge Thompson not be retained. Of the 55 non-attorneys who were surveyed 100% recommend retention. Appellate Judges gave Judge Thompson an average score of 3.75 compared to the 3.46 average score of all other district judges evaluated statewide during this retention cycle. On a 4.0 scale, Judge Thompson’s cumulative score was 3.65. Judge Thompson has been remarkable during his short tenure on the bench. He has worked diligently to improve how he is perceived in the courtroom, his management of his case load and his legal skills. In his interim review, Judge Thompson was personally concerned that attorneys and non-attorneys felt he was prosecution oriented. He has consciously worked to change this perception such that his current performance survey shows completely neutral results with respect to bias. Judge Thompson’s biggest deficit is the timeliness of his orders. This is related to Judge Thompson’s personal style and his desire for perfection, along with a significant case load. With the addition of a new District Court Judge and continued focus on internal deadlines, the Commission is confident that Judge Thompson will remedy this deficit. 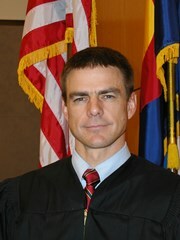 Despite being the newest Judge in the district, Judge Thompson was tapped by Justice Bender of the Colorado Supreme Court to take on the Chief Judge responsibilities for the district upon the retirement of the previous Chief Judge. This is a testament to his leadership skills and the respect he has within the judiciary. The Fifth Judicial District is fortunate to have a Judge of Mark Thompson’s caliber on our bench.